ANNIE, the world’s favourite family musical, comes to Southend, starring Craig Revel Horwood, the BBC’s Strictly Come Dancing judge, as the tyrannical Miss Hannigan! 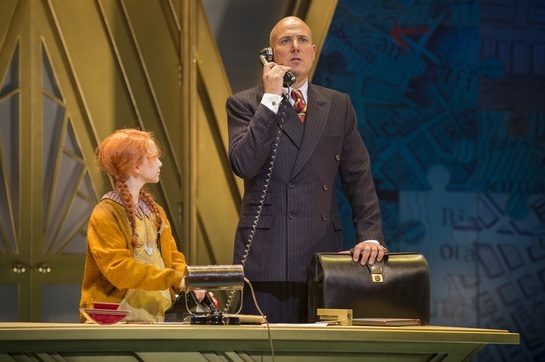 Alex Bourne is appearing as Daddy Warbucks in this touring production and he very kindly took some time out from the third week of the tour to answer a few of my questions. KT: Thanks for taking time out to answer some questions. How’s the tour going so far? AB: We're having so much fun and we feel so proud of this production. KT: Have you ever been to Southend-on-Sea before? Will you be sampling our Rossi ice-cream and taking the train to the end of the Pier? AB: I have been to Southend many times. I appeared in Buddy in 1993! My family are coming along for the week so there will lots of ice cream sampling! KT: How do you find touring? I imagine it must be tough being away from your family for long periods? AB: I haven't toured for 12 years and we've only been on the road for 3 weeks and so far it's ok. I see my family every weekend and in school hols they will spend time with me. KT: Lots of little girls (and boys) will come and see Annie and want to become performers. Who or what inspired you to get into the ‘business’? AB: I always did drama as a kid and played in bands, so performing was always something I enjoyed. I was offered a summer season in Jersey which got me my much needed equity card and it all took off from then. KT: Daddy Warbucks is one of those iconic roles that you instantly associate with bald headedness. Was there ever any compromise with the hair coming off or did you just go for it? AB: Having the right wig or haircut is very important to me in a show. So even though the creatives were discussing going down a non-bald route.. I just shaved it off so they had no choice! KT: Were you influenced in any way by Albert Finney in the 1982 film version of Annie? AB: Albert Finney is wonderful in the 1982 movie. But I also like Victor Garber in the 1999 Disney version... He's a little more sensitive. 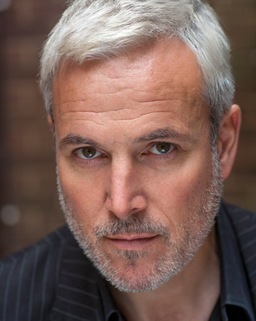 KT: Have you worked with Nicolai Foster before and do you think he has brought anything new to the production that will set it apart from any other production of Annie? AB: Nikolai has seen me in a few things but we haven't worked together before. I was very excited to work with him as everyone I spoke to just adores him. 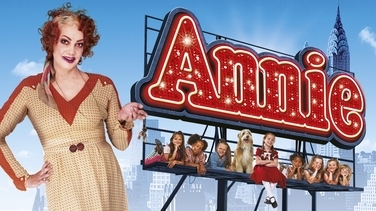 He and Nick Winston have created a slick contemporary cinematic version of Annie. Colin Richmond's design is fantastic. I feel that we have very much made this production our own. KT: You’ve worked with Craig Revel Horwood before, with him directing you as Daryl Van Horne in Witches of Eastwick - how was that? AB: I've only known Craig as a director, I've worked with him twice and we get on great and have a marvellous time. Craig doesn't waste any time when he directs, he gets a lot done in a short space of time and is always very creative. KT: A lot of people see Craig Revel Horwood as a very strict, no nonsense, humourless judge on Strictly. Please tell us that he’s a really just a pussycat under that scary facade? AB: As a judge I don't think he's mean at all ... He's just honest!! He's a big softy really. KT: Do you have any dressing room pre show good luck rituals? KT: Any views on that old W C Fields adage, “never work with children or animals”? AB: I don't have much to do with Amber, who plays Sandy ... And before I had a child of my own I may not have connected with the children in the show as well as I do. But these kids are fantastic! So talented and such fun to be around. KT: What have been your favourite roles - you’ve played some pretty amazing parts such as Buddy in Buddy Holly and Danny Zuko in Grease? Also, Frank ’N Furter in Rocky Horror must have been a blast? AB: Every job I've had has been the best part I could have played at that time in my life. So they've all been my favourite at the time. It was incredible to work with Trevor Nunn in Kiss Me, Kate at the Old Vic .. That was a highlight. KT: What will you be doing after the Annie tour is over? AB: We're touring until next May, so I have no plans afterwards. Let's hope Annie has a life after this tour. KT: What do you look forward to most when you go home? AB: Being in my home with my wife and daughter. KT: When you’re not performing, what do you like to do? AB: I'm a keen golfer and I shall be playing lots of golf everywhere we go! KT: What’s the most ‘showbizzy’ thing you have ever done? AB: Performing at the Olivier Awards. KT: What’s your dream role? AB: I don't have a dream role. I'll play anything. KT: What’s your favourite musical or play? KT: If you could meet anyone alive or dead, right now, who would it be and what would you say to them if they walked into the room? AB: Elvis. I would say, do you know I've just had to turn down Panto with your ex missus because I'm on the tour of Annie! KT: What’s the best piece of advice you’ve ever been given? KT: And finally, what advice do you have for any budding actors out there who may be thinking of going into the business of show or who are perhaps wanting to audition for drama school in the future? AB: You’ve got to really want to do it ... There are thousands of graduates every year, it's really hard. You also have to be ridiculously lucky ... Like I have been.